Donald Siegel (/ˈsiːɡəl/; October 26, 1912 – April 20, 1991) was an American film director and producer. His name variously appeared in the credits of his films as both Don Siegel and Donald Siegel. He is best known for the original sci-fi film Invasion of the Body Snatchers (1956), as well as five films with Clint Eastwood, including the police thriller Dirty Harry (1971) and the prison drama Escape from Alcatraz (1979), and John Wayne's final film, the 1976 Western The Shootist. Born to a Jewish family in Chicago, he attended schools in New York and later graduated from Jesus College, Cambridge in England. For a short time he studied at Beaux Arts in Paris, France, but left at age 20 and later made his way to Los Angeles. Siegel found work in the Warner Bros. film library after meeting producer Hal Wallis, and later rose to head of the Montage Department, where he directed thousands of montages, including the opening montage for Casablanca. In 1945 two shorts he directed, Star in the Night and Hitler Lives, won Academy Awards, which launched his career as a feature director. He directed whatever material came his way, often transcending the limitations of budget and script to produce interesting and adept works. He made the original Invasion of the Body Snatchers in 1956. He directed two episodes of The Twilight Zone, "The Self-Improvement of Salvadore Ross" and "Uncle Simon". He worked with Eli Wallach in The Lineup, Elvis Presley and Dolores del Río in Flaming Star (1960), with Steve McQueen in Hell Is for Heroes and Lee Marvin in the influential The Killers (1964) before directing a series of five films with Clint Eastwood that were commercially successful in addition to being well received by critics. These included the policiers Coogan's Bluff and Dirty Harry, the Albert Maltz-scripted Western Two Mules for Sister Sara, the cynical American Civil War melodrama The Beguiled and the prison-break picture Escape from Alcatraz. He was a considerable influence on Eastwood's own career as a director, and Eastwood's film Unforgiven is dedicated "for Don and Sergio". He had a long collaboration with composer Lalo Schifrin, who scored five of his films: Coogan's Bluff, The Beguiled, Dirty Harry, Charley Varrick and Telefon. Schifrin composed and recorded what would have been his sixth score for Siegel on Jinxed! (1982), but it was rejected by the studio despite Siegel's objections. This was one of several fights Siegel had on this, his last film. Siegel was also important to the career of director Sam Peckinpah. In 1954, Peckinpah was hired as a dialogue coach for Riot in Cell Block 11. 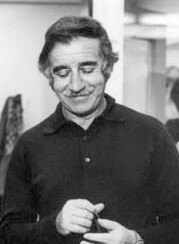 His job entailed acting as an assistant to the director, Siegel. The film was shot on location at Folsom Prison. Siegel's location work and his use of actual prisoners as extras in the film made a lasting impression on Peckinpah. He worked as a dialogue coach on four additional Siegel films: Private Hell 36 (1954), An Annapolis Story (1955), Invasion of the Body Snatchers (1956) and Crime in the Streets (1956). 25 years later, Peckinpah was all but banished from the industry due to his troubled film productions. Siegel gave the director a chance to return to filmmaking. He asked Peckinpah if he would be interested in directing 12 days of second unit work on Jinxed!. Peckinpah immediately accepted, and his earnest collaboration with his longtime friend was noted within the industry. While Peckinpah's work was uncredited, it would lead to his hiring as the director of his final film The Osterman Weekend (1983). He has a cameo role (as a bartender) in Eastwood's Play Misty for Me as well as in Dirty Harry. In Philip Kaufman's 1978 Invasion of the Body Snatchers, a remake of Siegel's own 1956 film, he appears as a "pod" taxi driver. In Charley Varrick starring Walter Matthau (a film slated for Eastwood but ultimately turned down by the actor), he has a cameo as a ping-pong player. Born 1912 in Chicago Don is the son of mandolin virtuoso Samuel Siegel. From 1948 to 1953 he was married to actress Viveca Lindfors, with whom he had a son, Kristoffer Tabori. He married Doe Avedon (a former model and actress and ex-wife of photographer Richard Avedon) in 1957. They adopted four children, Nowell Siegel, Anney Siegel-Wamsat, Katherine Saldiveri, and Jack Siegel. They divorced in 1975. He married Carol Rydall, former secretary to Clint Eastwood. They remained together until he died at the age of 78 from cancer in Nipomo, California. He is buried near Highway 1 in the coastal Cayucos-Morro Bay District Cemetery. Siegel was an atheist. ^ Erens, Patricia (August 1988). The Jew in American Cinema. Indiana University Press. ISBN 978-0-253-20493-6. ^ Reported by the Los Angeles Times in 1982. ^ Weddle, David (1994). If They Move...Kill 'Em!. Grove Press. pp. 116–119. ISBN 0-8021-3776-8. ^ Weddle, David (1994). If They Move...Kill 'Em!. Grove Press. pp. 534–535. ISBN 0-8021-3776-8. ^ "Jinxed!". imdb.com. Retrieved March 6, 2012. ^ David Robinson, 'Don Siegel's stories', The Times, 1 May 1975; pg. 11; Issue 59384; col E.